Seven Korean men created a show for the National Theatre of Korea and now it tours the world! This show, Korean Man, is led by extraordinary singer Heemoon Lee and features the jazz group, Prelude. Visually outstanding, it takes a hilarious look at male/female roles today, blending Korean folk music and jazz. Harmonica legend Jeduk Jeon is one of the great figures of Korean music today. Blind since birth, he’s been compared to Toots Thielemans for his formidably virtuosic style. Guitarist, Juwon Park’sband has been influenced by flamenco and gypsy jazz, but their range goes even wider. Expect a soulful celebration from this special collaboration. Hyelim Kim, a superb taegum (bamboo flute) player, has played with Nils Frahm and Lubomyr Melnyk, literally breathing new life into Korean traditional music, and she has reached out to singer Alice Zawadzki to join her in this partnership. Jamie Cullum called Alice “beautiful and uncategorisable – a real force to be reckoned with”, and her dramatic voice, warm humour and creative enthusiasm have left critics comparing her to Bjork and Tori Amos. Together, they chose guitarist Rob Luft and bassist Misha Mullov-Abbado to create a real band of titans for this one special performance. Woojae Park is best known for his beautiful collaborations with choreographer Sidi Larbi CherkaouiIn for Fractus V, described by The Guardian as “a marvellous braid of sound, fusing Middle Eastern influences to a wildly ecstatic pitch – as a fierce expression of unity, it resonates across the work”. His main instrument is the geomungo and for this concert he is joined by two of the other creative voices that joined him in Fractus V: Japanese drummer Shogo Yoshii, a member of the taiko ensemble Kodo, and British Indian composer and sarod player Soumik Datta, whose work bridges the world of Indian classical and contemporary music and whose artistic hallmarks are his collaborations with other artists: Beyonce, Jay-Z, Bill Bailey, Manu Delago, Akram Khan, Nitin Sawhney, Anoushka Shankar, Bernhard Schimpelsberger and Talvin Singh, to name a few. This concert focuses on the dramatic genres – opera from the West and Pansori (musical storytelling) from the East. In the first half of the concert, pansori singer Eunhye Jung and Sukki Yoon perform various excerpts out of the pansori literature, including three love songs from the most famous pansori, ‘Chunhyangga’. 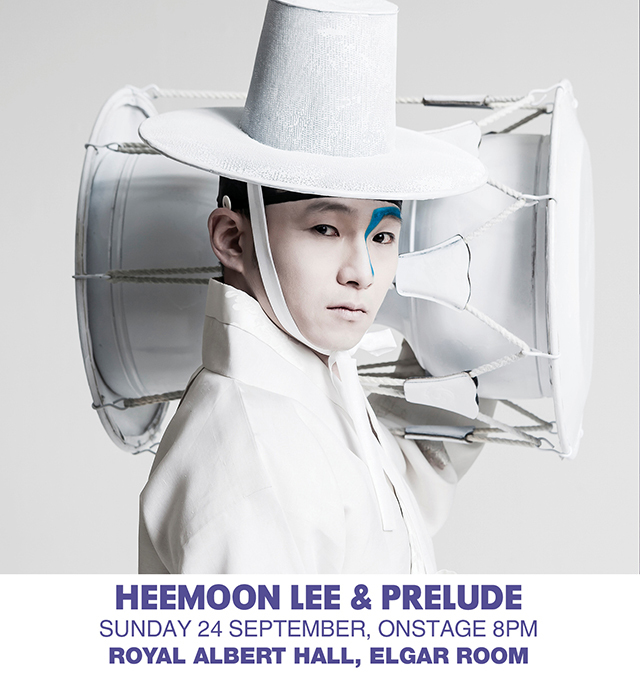 In the second half of the concert, Korean tenor Keonwoo Kim and Australian soprano Lauren Fagan, both from the Jette Parker Young Artist Programme of the Royal Opera House, with Jae Eun Shin on piano, sing love songs by Grieg, Strauss, Schubert, Lehár, Puccini and Korean composer Juwoon Kim. Psychedelic pansori-rock from Korea crashlands in Shoreditch en route to the Womex festival. AUX bring together screaming high-pitched sounds of the piri and taepyungso (wind instruments) and an intense rock groove of bass, drums, guitar, keyboards and Korean percussion. They’ve toured America after winning the Grand Prize of the 21st Century Korean Music Project, playing major venues like the Kennedy Center and Symphony Space. Their secret weapon is extraordinary pansori singer Eun Kyung Min, who soars from a growl to a scream, putting the seal on their stunning theatrical performance. Seoul may not be first city you think of when you say “ska!”, but there’s a fanatical ska and reggae movement there, and Korea’s ska pioneers, Kingston Rudieska, are at the front of the scene. They combine ska and jazz with a Korean twist – their great heroes are The Skatalites, and the band mix foot-stomping bluebeat instrumentals – fronted by four horns – with warm, soulful vocal numbers. They call their creation “FeastSka!” and they’re thrilled to be bringing it to London for the very first time. K-Music 2017 is part of the Korea/UK 2017-18 season, presented by the Korean Cultural Centre UK. This is a year-long reciprocal programme with the British Council, bringing UK artists and cultural producers to Korea, forging new partnerships between creative organisations in the UK and Korea and fostering greater cultural collaboration between both.